Baby, It’s Cold Outside. And In. Last week’s Thrifty District story was eerily familiar to me. My good friend Rebecca, over at Inspiration DC, has gone through almost the exact same Pepco disaster that Tiff featured in her post. She’s got a 700-square foot apartment, top floor of a building in eastern market, with two small bedrooms, one bathroom and a kitchen you can barely fit into. And she comes home to a $500 electricity bill. 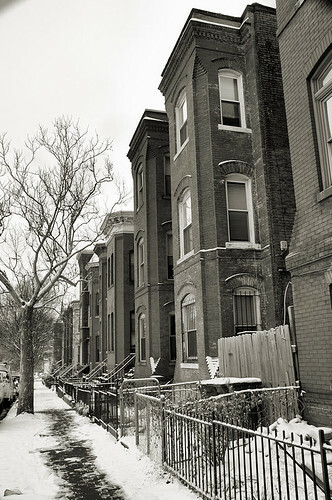 “When we got our first heating bill from Pepco at our new apartment I thought for sure it was an obvious mistake and would be cleared up quickly. No one in their right mind would pay $491.70 for a month of electricity and heat in a small 700 sq feet apartment. Now it has been a month, several angry phone calls later and we apparently owe them almost $900 for two months of heating and electricity. I could go into the details of how we have new windows, barely keep anything plugged in, and have our heat set at a frigid 62 degrees. But no matter those factors, it just does not add up to $500. We’ve talked with our neighbors and nobody else seems to be experiencing these surplus heat charges or any problems with Pepco for that matter. They’ve reread our meter and told us our bill is correct. After many phone calls and being told lies that our neighbors are paying the same amount as us our bill is now under “High Bill Investigation.” They told us they would assign someone to us in 4-6 weeks. Since Pepco just recently got onto twitter, Tiffany from WeLoveDC contacted them on my behalf concerning my bills and this article. They were surprisingly responsive at that point asking for my account information and that they would look into assigning someone to my case in a more timely fashion. So far we haven’t heard anything more concerning our case. We’ve then in turn argued with our apartment management company to investigate if something is malfunctioning in our heating system. All our maintenance woman would tell us is that it is a cold winter and everyone’s heat is high. You should get a rug and some curtains. She then lied and told us someone already looked at our heating system and it is fine. If you saw the amount of stuff we have in the closet with the furnace you would know this is an obvious lie. We pushed a little harder contacting the owners of our management company and threatening to file a complaint with the Washington DC Public Service Commission, DC Housing Regulation Administration, and/or the DC City Council. That finally got their attention and they agreed to look into it. But so far we haven’t heard anything more concerning someone coming to look at our heating system. So Andre is out there fighting Rebecca’s case, or at least as far as we know… and at least we did connect with a real person, who didn’t tell her to stick a rug on her floor. But so far the resolution isn’t there yet. That’s the thing with real-time media like blogging, in an ever-quick technologically advanced world, we expect real-time solutions. The blogging staff here at WLDC knows better than anyone that you guys out there in comment-world have strong opinions, about issues that are interesting to you, and you’re going to tell it like it is. So when Pepco opens themselves up to social media in this way, they’re opening themselves up to a barrel of monkeys, who will only start cheering if solutions happen. An ear out there for whining is great, but customer service in a new way is even better. Our team has looked into Rebecca’s case and while her account was already under investigation, I have flagged it for further follow-up. While her usage seems fairly consistent, we will still have someone come out to her home, inspect her meter, and see if there are any other factors that may be impacting her bill. If the investigation determines that the increase in her bill was due to an error on Pepco’s part, we will credit her account for the amount of the overcharge. Another thing to keep in mind is that our analysis has shown that Rebecca is an “all-electric” customer, meaning that she heats her home with electricity. We’ve just come out of two consecutive months that the National Weather Service has said is the coldest winter our region has seen in the past ten years. These frigid temperatures forced Rebecca’s heating system to run longer and consume more electricity to maintain a constant temperature. Another factor is that the holidays and inaugural activities caused her January billing cycle to be slightly longer than an average month. This all means that increased usage due to plunging temperatures and a slightly extended billing cycle may have played a role in these bills. However, as I said, we are going to conduct an investigation and I will keep both of you updated as more information becomes available. So what do you think about customer service on Twitter? When does it work? When does it fail? And is your heating bill extraordinarily high? Have you messages and gotten a response from Andre @PepcoConnect? This entry was posted in: The District, The Features, WTF? !